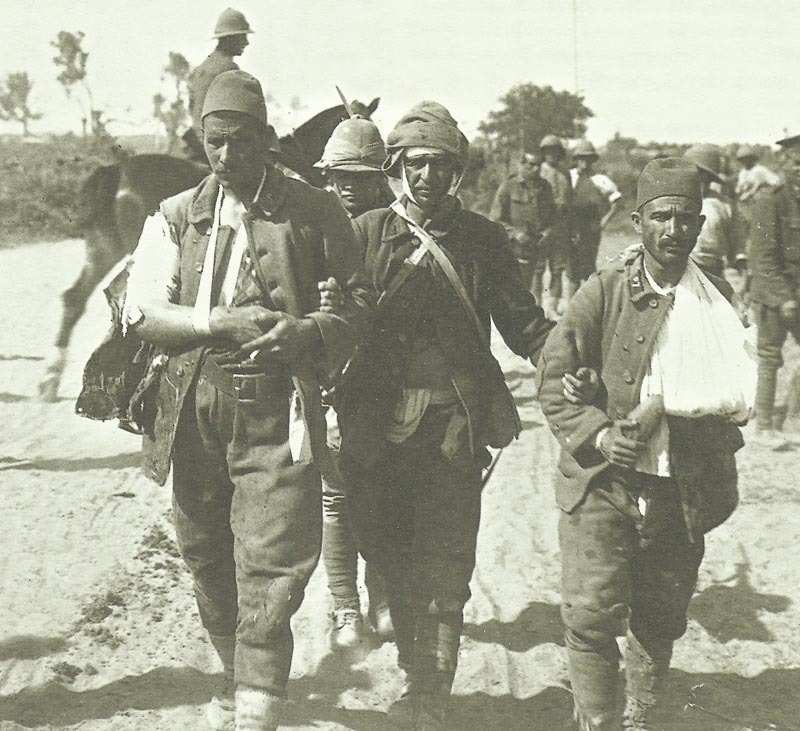 Three wounded Turk PoWs are escorted to the rear by British soldiers during the fighting in the victinity of the Suez Canal. Sinai – Battle of Romani (until August 5): Turkish troops (Kress) with 30 guns and 38 MGs drive back 2 Australian Light Horse Brigades and reach Wellington Ridge, but NZ and 5th Mounted Brigades retake it forcing Turk retreat (August 5). Turk casualties 5,000 men nd 4 guns. British loss 1,140 and 9 MGs (until August 9) out of 25,000. Armenia: Grand Duke Nicholas inspects Royal Navy Armoured Car Unit at Sarikamish; in action by August 27. Battle of the Somme: British and Austra­lians capture German second line trench system on 2,000-yards front north of Pozieres with 1,750 PoWs, advance continues on August 5. Brusilov offensive, Galicia: Sakharov renews offensive south of Brody, takes 8,581 PoWs and 7 villages until August 6; only 4 miles northeast of Lemberg­-Tarnopol railway away on August 10. Italian Front – SIXTH BATTLE OF THE ISONZO (­until August 17) begins after elaborate preparation including air photo­graphs with feint in Monfalcone coastal sector by 14th and 16th Divisions (29 battalions and 199 guns) (until August 10). Duke of Aosta’s Third Army has 16 divisions and 1,251 guns (533 heavy or medium) plus 774 mortars (138 heavy 10-inch mortars) for cutting wire entanglements against Austrian Fifth Army (Borcovic) with 9 divisions and 540 guns (147 heavy). Aegean: British escorts sink German coastal submarine UB44. Sinai: Up to 17 Royal Flying Corps aircraft (1 lost to anti-aircraft fire) active backing Battle of Romani (until August 9), shoot down 1 German aircraft and direct monitor fire.